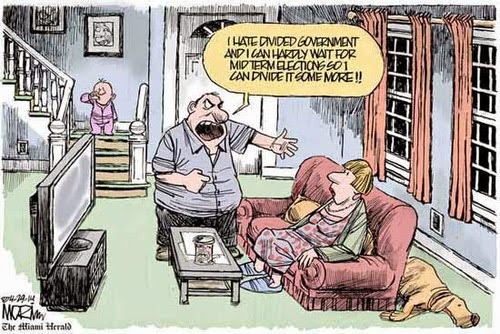 The Dividist Papers: It takes two to obstruct. It takes two to obstruct. "Democrats are at risk of losing control of the Senate this November, after a new poll found that voters prefer a Republican-controlled Congress to check President Barack Obama's agenda when his approval rating is at its lowest point ever." "Democrats, however, do enjoy an overall advantage on voter trust. Voters say they prefer Democrats' stances on health care (43-35), immigration (40-34), and the economy (41-38), among others. By a 40-34 margin, voters also say they trust Democrats to "coping with the main problems the nation faces over the next few years." 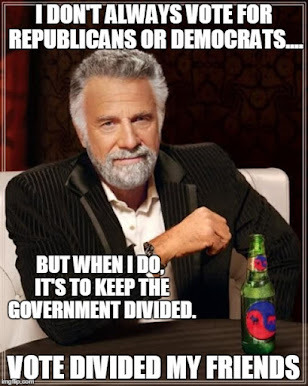 The Dividist interprets this apparent contradiction as indicating voters are no more inclined to trust Republicans with all the keys to the castle than they are Democrats. Which implies that losing the Senate in 2014 will actually help position Democrats to keep the White House in 2016 and extending divided government into the next administration. It's a good thing. "With Obama’s political career winding down and poll numbers continuing to languish, his party brethren fret that their own president — forced to work with GOP majorities — would give away the store on key policy issues ranging from the budget to energy and trade. It’s a concern congressional Democrats have voiced every time Obama and Vice President Joe Biden tried to cut big fiscal deals with Republicans — and the panic is now more palpable with the growing prospect of a Senate GOP majority." "Washington’s current gridlock may seem destined to last forever, but divided government has produced strange bedfellows before. President George W. Bush switched teams on some key issues in his final two years after Democrats took the House and Senate, becoming a cap-and-trade convert who bailed out Wall Street. President Bill Clinton partnered with the same Republicans who impeached him to overhaul welfare and balance the budget. And President Ronald Reagan and House Speaker Tip O’Neill found common ground reforming the Tax Code and Social Security." Note that George W. Bush's legacy included the biggest new entitlement since LBJ (Medicare Part D), increases in foreign aid for AIDS in Africa, and consequent massively increased deficits - all of which are generally considered policy positions usually associated with Democrats. Note that Bill Clinton's legacy included NAFTA, in addition to welfare reform and balancing the budget - policies usually associated with Republicans. Note that Ronald Reagan's legacy included nuclear arm reductions, revenue increases included in tax reform, comprehensive immigration reform, and increased deficits - all of which are policy positions generally associated with Democrats. And what can one say about Richard Nixon? EPA, OSHA, Ending the war in Vietnam, embracing Keynesian economics, imposing wage and price controls, opening China - clearly the most productive liberal president of the modern era. The lesson for President Obama is easy to learn. If, as president, you want a legacy that includes passing important legislation in a divided government, the way to accomplish that is to embrace and moderate the policy positions held dear by the opposition party controlling Congress. 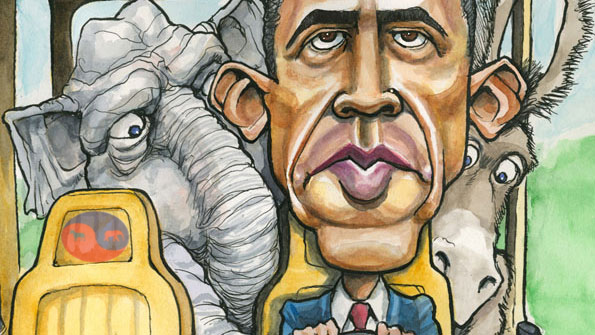 But it’s the prospect of what Obama might bargain on with Republicans that has Democrats really riled up. “I’m not going to create nightmares where none exist right now. But certainly for the paranoid there’s plenty to fear, and maybe even just for the fearful there’s plenty to fear,” Blumenthal said, while adding that he still had a “basic trust in [Obama’s] commitments and his instincts." Alaska Sen. Mark Begich, one of the most endangered 2014 Democrats, has begun to warn voters back home that they may have more to fear than a GOP Senate. He’s also bluntly telling Alaska seniors that they will lose Social Security benefits, given Obama’s willingness to lower annual cost-of-living adjustments as part of past attempts at a deficit deal." Decisions, decisions. Should Obama choose to burnish his legacy as an important productive President who "got things done" that actually last beyond the first day of the next administration? Or should he toe the Democratic Party line?